Oof, I’ve gone and done it again, haven’t I? Thanksgiving is only three days away and and here I am, bringing you a recipe at the eleventh hour when surely your menu was set in stone weeks ago (it was…wasn’t it?). The problem, if you must know, is that I’ve been having a hard time formulating a balanced, diplomatic description of this recipe’s merits, something that doesn’t start with ‘dispose of any other pecan pie recipes currently in your possession’, but since I don’t seem to be able to, I hope you’ll forgive me when I tell you that is exactly what you should do. This pie is, in fact, the product of many years of evolution. It made its way into the family via my mother, a woman who by her own admission is pretty hopeless in the kitchen but in this case demonstrated a remarkable nose for sniffing out a good recipe when she clipped it from the paper around the time I was born. It appeared in one of Pauline Phillips’ (aka Abagail Van Buren, aka ‘Dear Abby’) advice columns, who herself claimed to have gotten it from the pastry chef at the Phoenix Hotel in Lexington, Kentucky at some fancy dinner she attended there. I don’t know when the recipe was originally published or which reprint my mother clipped out, but apparently the pie was so popular among her readers that Abby was forced to run it nearly every November for years. In my family it was a huge hit, and quickly became an indispensable part of every holiday table, as first my mother, and then I, dug out that dog-eared clipping year after year. Over time, though, it began to undergo some changes. First, I discovered that lightly toasting the nuts before putting them in the pie improves both their flavor and texture. Then, after having one too many pies come out burnt on top and soupy in the middle I adjusted the heat and discovered that pecan pies are best baked gently. The biggest breakthrough of all, though – the one that takes this pie out of the clouds and catapults it into the stratosphere – happened when I moved to corn-syrup-less Europe and discovered that not only was one of the most delicious sweetening agents ever invented all but unknown in my country, but it makes the best pecan pie this side of Kentucky (if not even better!). The miracle nectar? Lyle’s golden syrup. I know abandoning the traditional corn syrup may sound like heresy to some, but not only is golden syrup (a by-product of cane sugar refining) probably more historically accurate in pecan pie (which has been around considerably longer than corn refining technology…), it tastes so much better that even making the comparison is not really fair. Corn syrup, after all, has very little flavor of its own; golden syrup, on the other hand, is full of a caramel-toffee complexity that simultaneously manages to seem more intense, yet less sweet. Pecan pie made with it tastes – if this makes any sense – more like it should. And oh, there are so many delicious things you can do with the leftover syrup: slather it on buttered toast, drizzle it on yogurt, even eat it straight from the green and gold tin in great silky, slippery spoonfuls – but I’m sure you’ll quickly figure that out for yourself. Then again, you might just decide you want another pie. Okay, okay, so where on earth can you buy golden syrup? If you’re in Canada, Australia, or most of Europe, it should be a cinch. In the U.S., unfortunately, it’s not that common. You can buy it on amazon, but I realize that’s pushing it a little for Thanksgiving unless you want to exchange a kidney for overnight delivery. Major chain stores that usually carry it are Whole Foods and Cost Plus World Market (although the latter seems to be having some supply problems, at least in the Seattle area). Other good bets are gourmet or specialty-food stores, or any place that carries British products. In the Seattle area, De Lauenti in the Pike Place Market normally carries it (although they too were out when I was in recently), and Central Market in Shoreline, Mill Creek and Poulsbo do too. If you really can’t find any, though, rest assured that this pie has still won millions of devoted fans with corn syrup – just promise me you’ll get ahold of golden syrup at some point and give it a try. Deal? p.s. Lyle’s golden syrup is made by an acid-based inverting process that creates sodium chloride as its by-product, i.e. salt. This gives the syrup a distinctive (and delicious) salty tang and means that recipes in which you substitute Lyle’s for, say, corn syrup should have the salt reduced. Likewise, if you use corn syrup in the recipe below (or a non-salty brand of golden syrup—taste it if you’re unsure), the salt needs to be increased to 3/4 teaspoon. Preheat the oven to 325F/160C. Spread the pecans on a large baking sheet and toast in the oven until just fragrant, about 10 minutes. Remove and let cool. In a large bowl, whisk together the golden syrup, sugar, salt, butter and vanilla until smooth. Whisk in the eggs. Pour the mixture into your 9-inch unbaked pie shell. Sprinkle the cooled pecans over the top. Place on the center rack in the oven and bake for about 1 – 1 1/4 hours, or until the center puffs slightly and a toothpick inserted in the center comes out clean. If the crust begins to brown too much, cover it with foil. Serve warm or at room temperature, with a dollop of unsweetened whipped cream. I hope you have a great Thanksgiving holiday! God, I discovered Golden Syrup in the delicatessen down the road andthere was no going back. It makes the PERFECT caramel sauce in no time! Plus its flavour is just incerdible. In my (British) family we make pecan pie with half and half golden syrup and treacle. I think the original recipe we used was 100% treacle but it was too intense. Wow! Just in the nick of time since I am baking Thanksgiving pies today, including my standard cranberry-apple-raisin-walnut pie. Now to find golden syrup on the East Coast ….. I think I’ll make this. I like to use sorghum molasses instead of corn syrup, gives it that old timey flavor. A fabulous looking pie. Actually, just (JUST!) in the nick of time. My wife wanted to do a pecan pie (I really don’t bake..), and this one looks great. Fingers crossed I can find the golden syrup – I remember it back in the UK.Great photo as usual. Well, I just moved to London and have been considering what to make for my (belated, makeshift) Thanksgiving-for-dummies — that is, Thanksgiving for Norwegians, Japanese, Ukrainians, and others whose only impression of the holiday comes from ‘Friends’. Pecan pie is the quintessential dessert, and I can only imagine how much better it tastes when made with golden syrup.My mother and I used to make a chocolate pecan pie which was out of this world — in that case, perhaps corn syrup is best because it provides a clean (ahem, tasteless) background for the chocolate, while maintaining the optimal consistency.Thanks so much for the recipe! I look forward to trying it. Not that you need any confirmation – but yes the golden syrup pecan pie has been around for a long time and yes it is WAY better than corn syrup. 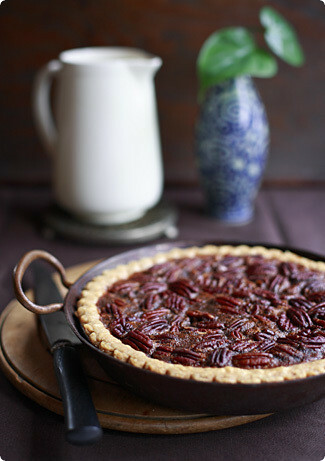 We’ve even used it in a recipe for a "wet bottom" shoo-fly pie, pecan pie’s Penna-Dutch uncle. I think the golden syrup gives a much sweeter and richer flavor – and stands up to our darker "Seattle" coffees a little better. Yum! I have made pecan pies for years. However, sometimes it doesn’t gel. I always make it the same. Why does it do this and how can I stop it from coming out runny? This is a great looking pie and might change many Thanksgiving menus that were set weeks ago! I live in Upstate SC and Ingles, an NC based supermarket, carries Lyle’s plus another one, Golden Eagle Syrup. Golden Eagle even has a recipe for pecan pie on the label. I remember when I was growing up in Low Country SC that one of my grandmothers always kept a can of cane syrup on the table. Once I discovered Lyle’s, I thought I would see if there was something similar at the grocery given its southern roots. Lo and behold, both are there, and both are good! I only use golden syrup now instead of corn syrup. I’m so glad you posted this! I, too, have been looking for the perfect Pecan Pie…thanks for this recipe. Ballard Market carries Lyle’s Golden Syrup, too. Mindy – I don’t know why that happens some times and not others, but I find that baking the pie at a lower temperature for a longer time really helps. Just make sure you keep baking until the center puffs up and a toothpick comes out clean, covering the top loosely with foil if things are browning too quickly. I’ve been making this pie for years, from a recipe in (the late) Richard Sax’s ‘Classic Home Desserts’ that is almost identical to yours (less butter, less Lyle’s, a bit of dark rum – he even recommends muscovado). Apparently he got it from John Thorne. It definately is a winner. You are the second person to recommend Lyle’s Golden Syrup to me. Fortunately, I live in Canada and can get some easily. Since I’m willing to pitch all other pecan pie recipes, I’ll give this a whirl. Just don’t mess with my mom’s butter tarts. OK – we did get round to making this recipe for thanksgiving! We had to use corn syrup instead of golden though 😦 Blimey, I remember pretty much every pantry in the UK had some, all the time – but you are right, it is really hard to find here, especially in short notice.Anyhow – it turned out great. The best pecan pie I have ever eaten. The shear fact I ate some tells how good it was – I am normally not a fan of pecan pie. We tried this recipe for Thanksgiving, stumbled on it by accident, and it was delicious. It has a real interesting and unexplainable type of sweetness to it. Thanks for the accidental tip!!! Thanks for the tip on Lyle’s golden syrup. Now I know what to use even when I’m far from home. Hello Melissa….Yes, we DO have Lyle’s golden syrup here in Vancouver. In fact, I have it in my cupboard! I most certainly will make your pecan pie recipe….will probably use salted butter though and let it become browned butter so it will have a more nutty flavour. What do you think? You have some great food suggestions. I’d vote for golden syrup over corn syrup every time but being English that’s possibly because I’ve only tried cooking with corn syrup once. You can’t seem to get it here. You can get corn syrup here in the UK but only from specialty suppliers, like the one Whole Foods in London or online shops. And it aint cheap!See, I was always afraid to substitute golden syrup for corn syrup, being a purist and all. I’m so excited to try it now! How do we all feel about maple-pecan pie? Can you really go wrong? I think not. Growing up in North Carolina, I learned to celebrate the family holidays with Velvet Cake and pecan pie. It’s still not a family feast without a slice of either (or both).Over the years, I’ve developed my own recipes, which I’m quite fond of and have the midsection to prove it, unfortunately, but I’m excited about giving yours a try. I might have to add some chocolate and some bourbon: I hope you won’t mind.Also, if you’re in Seattle, the Metropolitan Market carries Lyle’s syrup, too. Thanks for the tp about golden syrup! I have seen Lyle’s at World Market and Trader Joe’s but didn’t know it would make a real difference in my pecan pie! I tried this pie recipe in a double batch, it was absolutely phenomenal. The pecan pie paired wonderfully with vanilla bean ice cream. However, I was unable to obtain the "golden syrup," and used a mixture of light and dark corn syrup (very little dark syrup, I ran out of light at the last second). I would definitely like to try making it again with the Lyle’s syrup, if I can ever find it. Jo – In the UK corn syrup was also very difficult to find. No matter, you can always substitute golden syrup!FoodJunkie – Oh, I haven’t tried caramel sauce with it – what a great idea!Susy – Now that’s a new take on pecan pie for me. I don’t know if I’ve ever had sorghum molasses. How does it make the pie taste?Renee – Great tip on the Golden Eagle syrup! Hopefully it will help some people who can’t find Lyle’s locally.Joy – I actually put John Thorne’s pie up against this one in a taste test one year. Most people liked this one’s softer, slightly more custardy filling and crisper nuts, but apart from that they were very similar.Charmian – Can you believe I’ve never had a butter tart? I don’t know what I’ve been doing with myself all these years, but that much change!Matt – High praise indeed! Just try it with Lyle’s next time – it’ll be even better!HTFTCA and Kristie – Fantastic, so glad to hear! :)Betty – I think browned butter is a great idea. And yes, it could certainly be salted butter, though I’d be careful with the salt later – for some reason golden syrup always makes things taste saltier.Amanda – You’re not missing much! I’d be happy to never use corn syrup again, if that means I can have a steady supply of Lyle’s. Amanda – I’m having the reverse problem here! Golden syrup was so cheap for so many years, and now it’s an expensive luxury. Maybe you and I should start doing some transatlantic exchanges…Joey – Who could possibly mind chocolate and bourbon? I’d love to know how it turns out!Deborah – Ooh, you’ve seen it at Trader Joe’s? I’ll look next time I’m there – at my local supermarket it’s roughly the price of a kidney…Ji Yeon – So glad you liked it! Can you believe I’ve never tried it with vanilla ice cream? That must be remedied! And yes, do keep an eye out for the golden syrup. You didn’t mention where you live, but it must be available somewhere…Adam – Golden syrup is pretty amazing, isn’t it? I know what you mean about chocolate, it seems to tame the pie’s sweetness a bit, though unfortunately it doesn’t make it any less rich! That said, I rarely add it since I always make a Toll House pie alongside (Manuel’s favorite), and that has more than enough chocolate for everyone. Have never made pecan pie before but tried this recipe in honor of Mardi Gras. Excellent!! The golden syrup gave it a buttery, toffee-like flavor that I loved. It’s a keeper!! Hi Melissa. London-based food blogger here. Just baked your pecan pie, using the flaky crust recipe link. Truly wonderful, particularly the flaky pastry. Being rather new to baking, I’d never heard of using cream cheese and vinegar in pastry, but it worked a treat. The pie is a little burnt on top due to an over-enthusiastic oven, but icing sugar’s conceiled the worst, and it still tastes superb. This is the second recipe of yours I’ve tried – can’t wait to try more. Thank you! Ventured here and thought I'd try this recipe tonight when I found Lyle's Golden Syrup in a quest to avoid corn syrup this time around for pecan pie. Making a couple modifications such as adding 1 Tablespoon Bourbon instead of the vanilla extract and chopping half the toasted pecans for the filling, the remaining halves for the top. I'm sure it'll be great, only concerned about the set. I'll update with results and family comments. Thanks. This pie is becoming a Thanksgiving Day staple for our family. So tasty. FYI: for those of you in California, Fresh & Easy Market stocks Lyle's Golden Syrup as an everyday item in their British food section. No surprise; they're owned by Tesco. Thanks for the recipe. I finally got a bag of Pecans and want to try this recipe. Pecans are hard to get here in Denmark. I found some Muscovado sugar, but I can't find Golden syrup or Lyle's. I've seen bottles of light and dark syrup, but I don't know if they are good. "Dan Sukker" has them. I did see a bottle of "Mississippi pancake syrup", but I doubt that's the right one. Well, I'll probably have to use that "normal" light syrup Dan Sukker have.